I love it. I really do. That’s why I thought it was a genius idea to create a wrap made of socca. For a moment I felt like a rocket scientist, or Nobel Prize winner or something. Alas, that lasted only for a couple of minutes as a quick trip on the internet brought me back to reality as I discovered that socca wraps are a common street-food in the South of France. Pff....Frenchies, always cramping my style. Yet, it doesn’t change the fact that using socca to make wraps is genius. Final. As with tortillas, there are a tons of different spins on socca. You can add spices, herbs, etc. What you’ll find here is the basic recipe, simplified. You can run with it, make it your own and give yourself license to play with the ingredients.As I don’t own an open-air oven at home (I know, how lame) I cooked the socca in a thick-bottom skillet on the stove top. Easier, quicker and cheaper. Also I made it thinner; it served better my purposes to use it as a wrap. 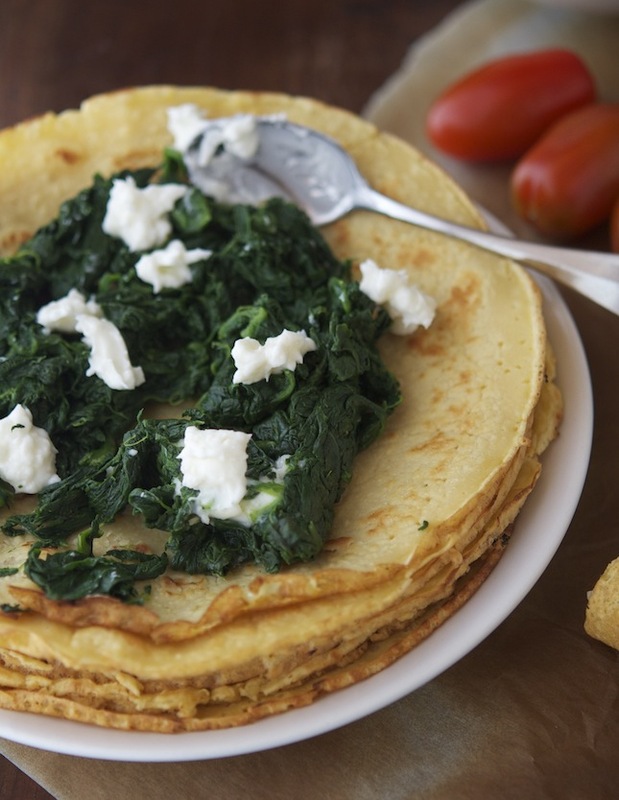 As I like to take the "green road", I topped my socca wraps with some spinach and soft cheese. Which takes me to the next point: soft cheese. The other day I went to my fave Italian grocery (Buon Italia in Chelsea Market), a store I go to often. It is in many ways a great Italian food shop where you can find almost everything Italian-food related, at a reasonable New York price. As I was shopping, the store clerk talked me into buying Stracchino cheese: a soft, buttery and spreadable cheese. It’s a bit sticky and gooey but proved to be the perfect companion for the spinach. I guess that any other soft cheese would work. I tried also brie cheese, but I was quickly reminded that brie cheese is one of my least favorite molds to top a sandwich with, and no amount of humorous puns could mask its pungency. Better to stick with milder cheeses. Anyway, you’ll have to try it for yourself. 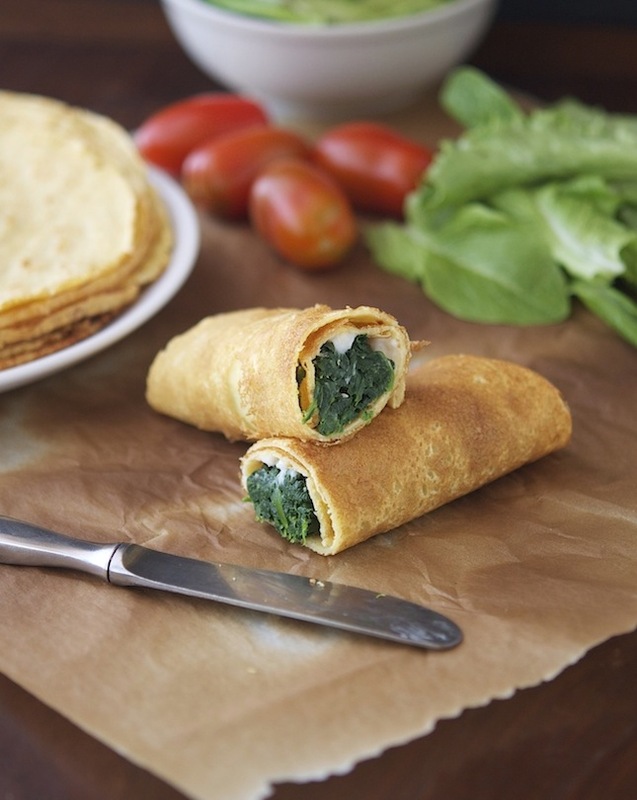 Socca Wraps with Spinach and Stracchino Cheese Print this recipe! In a bowl whisk the chickpea flour and water until well combined. Cover with a lid and let rest at room temperature. In an ideal world the batter should rest for 4 to 10 hours, in the real world let it rest as much as you can. Once the waiting time is over, add the olive oil and salt to the mixture and whisk well. Lightly grease a 6-inch pan (if possible with a thick bottom) with olive oil. Warm it on a medium-low flame and scoop one medium ladleful of batter into the pan. Cook for about 2 to 3 minutes per side. The Socca should become of a golden/brown color on both sides but still retain some of the moisture (you don’t want to dry it out too much). The cooking time really depends on how thick you’re making the wraps. The thicker, the longer it’ll cook. Heat one tablespoon of olive oil in your largest soup pot add the spinach to the pan all at once, if possible. Cook, stirring all the while, until the spinach is collapsed and wilted, a couple of minutes. If you need to add the spinach in batches (adding more spinach as it collapses), that is fine too, just do it as quickly as possible. Season with salt and pepper. Transfer to a bowl and set aside. 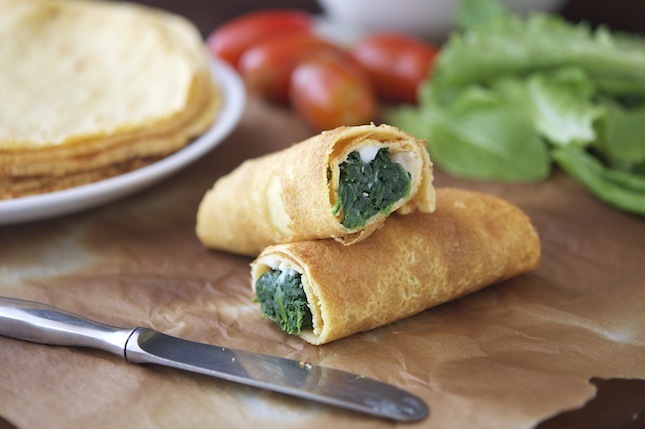 To enjoy, scoop spinach into socca wraps, top with some stracchino cheese and fold up like a taco. If you’re do this ahead make sure to warm them in the oven/microwave, They’re best if served warm. Eat em up! One socca (without filling) yields 47 calories, 2 grams of fat, 5 grams of carbs, and 2 grams of protein. 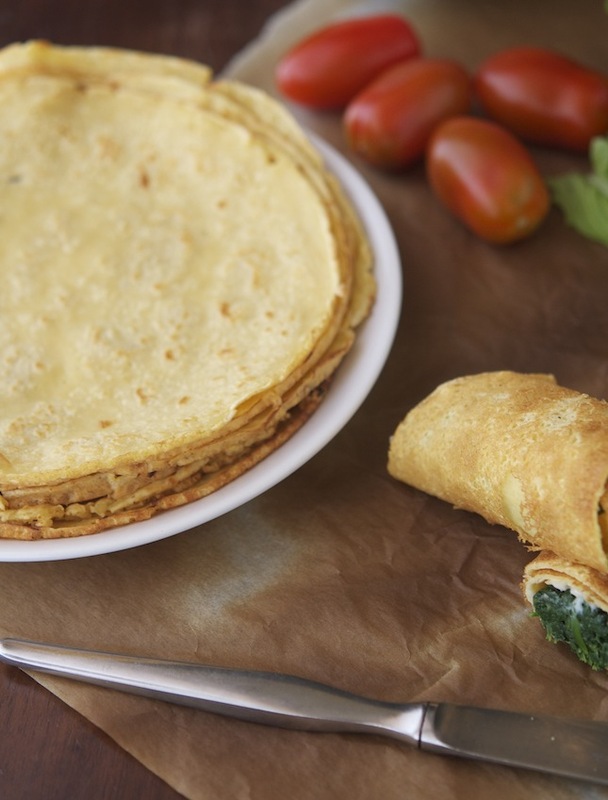 One socca wrap with spinach and stracchino cheese yields 86 calories, 5 grams of fat, 8 grams of carbs, and 5 grams of protein. This looks great - can't wait to try it out! I love socca - this filling looks amazing!